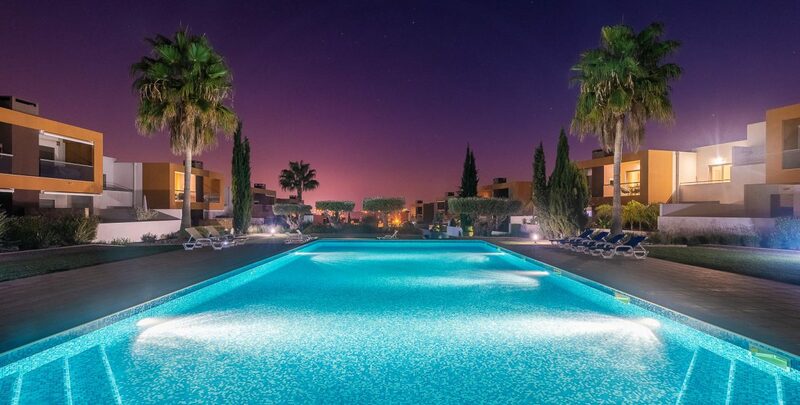 VakantiehuisAlgarve is a comfortable 2 bedroom holiday apartment located 2.3 km from beautiful Galé beach, 1.2 km from Salgadosgolf and offers accommodation in Vale de Parra, Albufeira. The apartment is situated on the first, also upper floor and is part of a luxury, small and closed complex with two large swimming pools and a small swimming pool for children. The whole is surrounded by beautiful, well-kept gardens. Parking is sufficient. The layout of the apartment is as follows: hall, spacious living room with dining area, large modern kitchen with various appliances such as fridge, freezer, microwave, oven, dishwasher and washing machine. The kitchen has a balcony where you can enjoy the afternoon sun and in the far distance you can see the ocean. There are two bedrooms and two bathrooms in the apartment of which one is ensuite. The master bedroom has a balcony that looks, like the balcony of the living room, over the pool and the garden. Both bedrooms have spacious wardrobe closets. In the apartment there is TV and radio, a DVD player, air conditioning and WIFI. You will find a translate button on every other page of this website with which you can choose your preferred language.